This lovely 2-bedroom/2-bathroom OCEAN FRONT condominium is a corner unit located in 'The Pointe' oceanfront property on Indian Shores Beach on the Gulf of Mexico. Indian Shores is a charming and relaxed gulf coast community just 18 miles west of Tampa in the middle of an island with Clearwater to the north and St. Petersburg Beach to the south. The condo is located directly on Indian Shores / Indian Rocks Beach and is across the street from The Salt Rock Bar and Grill (one of the best restaurants in the area)... The complex is called The Pointe because we sit out the farthest of any complex on the sand making us the closest to the water. Being a corner unit with nothing infront of or beside us gives this unit one of the most panoramic views possible. This corner unit comes fully furnished with all stainless steel appliances, granite counters, maple cabinets, custom bathrooms with full tile, Berber carpet, custom furniture, furnished private balcony etc. 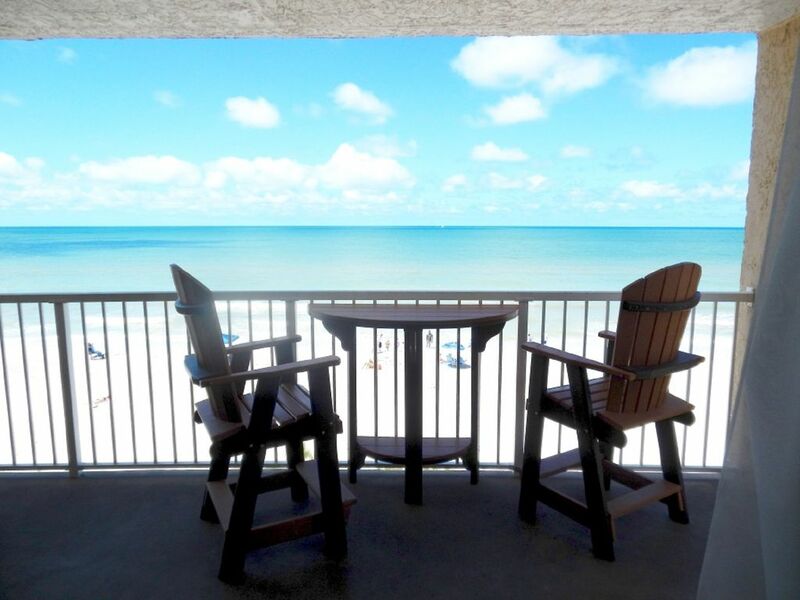 Our Florida gulf coast condo in Indian Shores features a 3rd floor, private corner balcony with patio furniture and has a beautiful view that looks all the way out and all the way down the gulf on both sides! A reserved parking space in our under-the-building parking garage protects your vehicle from heating up in the hot Florida sun. For your entertainment, there is 40' HIGH DEFINITION LCD FLAT SCREEN Cable TV with several premium and on demand movie channels all included, a VCR, DVD/Blu-Ray player and stereo in the living room. We even include a DVD library with over 50 top box office titles. Our Florida gulf coast family condo has a beautiful, modern, full-size kitchen that includes all stainless steel appliances and includes a large refrigerator with ice maker, stove, oven, microwave, dishwasher, garbage disposal, coffeemaker, cookware, bake ware, glasses and utensils. The kitchen even comes complete with a high end KEURIG coffee brewer. We even provide a carousel stocked with a variety of gourmet coffee to get you started so your first morning is as bright as can be. The master bedroom has a QUEEN-size bed and private full bath and the windows even feature shades with a light blocking feature to let you sleep away the day if you like! The second bedroom has a QUEEN-size bed and separate full bath. There is also a new pull out sleeper sofa with high end sleeper mattress. Busch Gardens in Tampa Bay is only 45 minutes and Orlando Theme Parks (Disney World, Sea World, Universal Studios, MGM, Epcott Center) are about 90 minutes. Surrounded by warm, gentle surf and plenty to do, or do nothing but relax and walk barefoot on the beautiful, white sandy beach right outside your door. Easy access to all central Florida and gulf coast world-famous attractions, including Disney, Orlando theme parks, Universal Studios, MGM, Wet and Wild Water Park, Epcot Center. Our luxury gulf coast Florida vacation condo is only 45 minutes from Busch Gardens in Tampa Bay. Walk to mini-market, great restaurants, shops and entertainment. Enjoy beachside volleyball, swimming in the warm Florida gulf coast waters, sunning, snorkeling, shelling, sand castles, fishing, boogie boarding, parasailing, miniature golf, public golf courses and glorious sunsets. I have always been a water person for recreation and loved owning and fixing up real estate professionally. I have always love the beach and the water. When I started looking to buy a place I found this property early on but kept looking. NOTHING else I saw had a view that was even close. Most had a building next to you or in front of you and just didn't have the same sweeping views. It was one of a kind. I remodeled the condo as owner occupied while I was spending a couple weeks a month in Florida for work. Now that my work has ended I get to share it with all the great folks on VRBO. ENJOY! Both bathrooms are recently remodeled with high end fixtures, custom tile etc. Large great room with leather couches, sleeper sofa, tile floors and throw rugs with a balcony right above the sand overlooking the gulf. 40' Flat screen plasma/LCD HIGH DEFINITION TV with Brighthouse cable service with virtually every available channel and some movie channels in living room. 'Smart' TV's in both bedrooms! Also a fairly large DVD collection for your enjoyment. High end Bose wifi stereo to pair with your own ipod or wifi music. I don't promise any specific gear but there is a bin that always has an array of various toys etc. We had a wonderful month of March at Lyle's condo. Everything was as described. Hope to stay again soon. The condo itself is beautiful & and the ocean view comes right into the living area. Spectacular! Lyle has been the best landlord; he always is quick to respond to our questions & is very personable. We have stayed in the condo for the last 2 years & will return again next year. We just love it! IThe condo is not only comfy & well taken care of, but very light & bright with high end finishes. We have been winter renters for 6 years & this is by far the best place we have ever rented. Early Christmas Gift of Relaxation! The condo’s view of the gulf was worth every cent and more! The amenities, new appliances, cleanliness, view and the location makes this condo my preferred choice and would highly recommend it to anyone. The owner is very responsive and reasonable. I can’t wait to book this property again to see changes, upgrades or just the breathtaking view. We loved the view of the ocean from our balcony. The beach area was very well manicured daily making it a wonderful area to sit and watch and enjoy the ocean. We saw dolphins playing in the water several days which was great. We talked with the owner several times and he was always very nice and helpful. Final Payment is due 60 days prior to arrival. Please plan to pay via check or money order or an additional charge of $25 will be required for credit card, online payment, paypal or home away payments if used for final payment. Jan - March is rented on a calendar month basis only. Please note that rates are only a guide and actual rates will vary with certainly holiday periods being slightly higher. Please contact owner directly for best available rates for your dates.